No word yet as to whether arrests connected to series of bombings targeting Hezbollah strongholds. Four men have reportedly been arrested in the town of Naameh, south of the Lebanese capital Beirut, according to the Daily Star. The men were apparently part of a "car-bombing ring," and their arrest followed the discovery of a large stash of explosives in a car in the same town, including five containers with 50 kilograms of TNT and a remote detonator in each. The Interior Minister, who announced the arrests, would not confirm if they were connected to that incident, but anonymous security sources told the Lebanese paper that that was indeed the case. One of the arrested men is believed to be the ringleader - a 50 year-old Salafi extremist. Police are still hunting for a fifth man, named as Mohammad Assem Ahmad. The arrests come at a very sensitive time for Lebanon, whose patchwork of ethnic and religious communities has been teetering on the brink of civil war as a result of the increasingly sectarian conflict in Syria. Only three days ago a car bomb ripped through a Hezbollah-dominated neighborhood in Beirut, killing 20 and wounding scores of others. It was the second - and most deadly - such attack in recent months, and was claimed by a Sunni group loyal to the Syrian rebels as revenge for the military intervention by the Shi'a Hezbollah on behalf of the Syrian government. 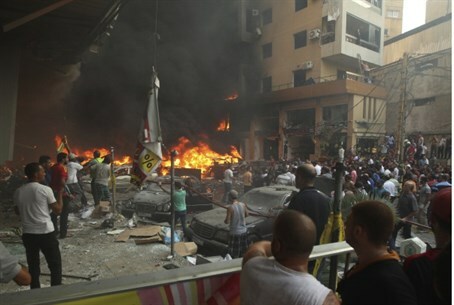 A previous attack targeting Hezbollah left at least 50 people wounded. There has been no word on whether the arrested men had anything to do with either attack.